Enjoy the benefits of a stainless steel tank! There’s no need to deal with plugged nozzles on rollers and planers anymore. Plus, our stainless tanks are also competitively price to regular carbon steel tanks, and they have a service life of 20+ years–at that price you can’t beat! 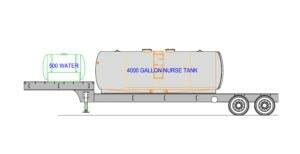 At Osco Tank & Truck Sales, we have 1000-4000 Gallon Stainless Steel Tanks available. Osco Stainless Steel Tanks are also built from high quality 304 grade stainless and designed for decades of trouble free service. We also treat you to the best products and service, just as we would treat family and friends. 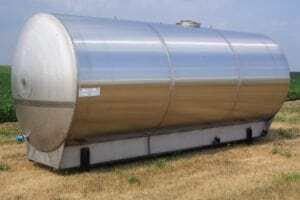 What are the Options for Stainless Fertilizer Tanks? Front street flusher nozzles for cleaning off pavement. Plus, each nozzle can also be adjusted in direction and they can be controlled from the cab. Custom bodies for asphalt and concrete crews. Options also include fuel transfer tanks, tool boxes, product tanks, warning lights, and trailer hitches. Osco Tank can also install custom spray bars for water trucks, remote water cannons, hose reels, and too many other options to list. Give us a call for more information or if you don’t see what you need! Plus, we are happy to help you find the best fit for your custom truck. Don’t see the stainless fertilizer tanks you need? We can help! Give us a call. We want to give you the truck that best fits your needs, and we’re happy to work with you to make that happen. Contact us today for more information and to get started on your truck.